The papaya, papaw is also known as pawpaw is a fruit with amazing taste and marvelous health benefits. 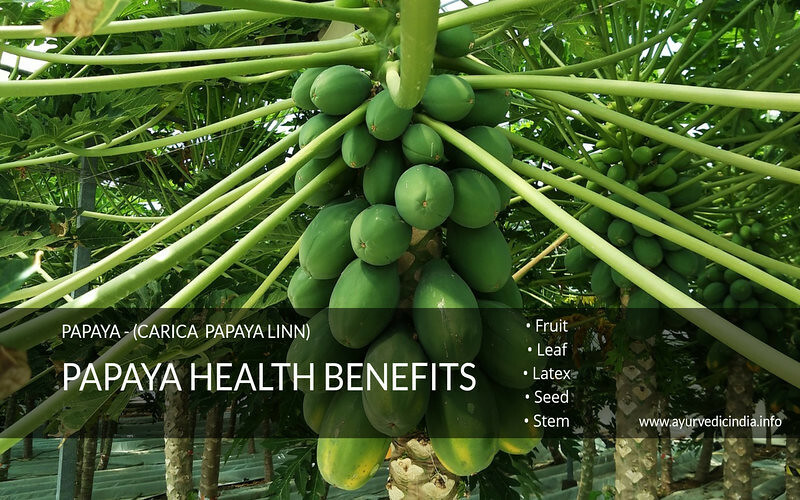 Scientifically papaw is known as “Carica papaya Linn” has become well recognized for its exceptional nutritional and remedial properties around the world. There are many health benefits of papaya, the amazing about it is that the plant, including its stem, ripe fruits, unripe fruits, leave, seeds and papaya leaf juice are used in Ayurveda as traditional medicine. The foremost medicinal properties of Papaya include Uterotonic, Anti-fertility, Anti-hypertensive, Diuretic, Anti-helminthic, Hypolipidemic, Anti-bacterial, Anti-fungal, Anti-tumor, Free radical scavenging including Wound and healing effects. What makes papaya benefit for health and a remedial fruit? It is due to it contains enzymes (Papain), alkaloids, carotenoids, flavonoids, monoterpene, vitamins, and minerals. 1. Latex: relieves dyspepsia, anthelmintic, burns pain, diarrhea, stomachic, whooping cough, and bleeding hemorrhoids. 2. Ripe fruits: digestive, Stomachic, diuretic, carminative, dysentery expectorant, chronic diarrhea, tonic, sedative, bleeding piles, relieves obesity, psoriasis, wounds of the urinary tract, skin diseases and ringworm. 3. Unripe fruit: diuretic, Laxative, enlarged spleen (dried fruit), liver, Abortifacient, snakebite, antibacterial activity, and anti-implantation activity. 4. Seeds: emmenagogue, Carminative, counter-irritant, Abortifacient, vermifuge, its paste is for the treatment of psoriasis, infertility in males and ringworm. 5. Seed juice: enlarged liver, spleen and bleeding piles. 6. Root: diuretic, Abortifacient, anti-fungal, piles, activity and for checking irregular bleeding from the uterus. 7. Leaves: There are many benefits of papaya leaves, they are used as a vegetable, for dressing wounds, the fine paste is used for jaundice, it infusion is used for gonorrhea and urinary complaints, in colic, vermifuge, beriberi, fever, abortion, its smoke is used for asthma. 8. Flowers: emmenagogue, Jaundice, pectoral properties, and febrifuge. 9. Stem bark: anti-hemolytic activity, sore teeth (inner bark), anti-fungal activity, Jaundice, dengue fever, and sexually transmitted disease. It cures dengue fever naturally: Today Papaya leaf extract is widely used as a treatment for Dengue fever than conventional medicine in many countries. Papaya leaves are well known ayurvedic medicine for dengue fever science the ancient times. Although there is no particular remedy for the disease, but Ayurveda emphasizes to strengthen the immune system of the body by keeping in control hyperthermia. The other benefit of papaya leaves is that they can fight other viral infections such as the common cold virus. The surprising thing about papaya for health benefits is that it contains over 50 ingredients that support the immune system along with important Vitamins such as A, C, and E. The natural ingredients found in leaves help to regenerate white blood cells and platelets. There are many cosmetic products from the market that often features papaya in various creams, face masks, hair softeners. Its indications are simple; papaya is best for beauty benefits. It is due to “vitamin E” and “beta carotene” in Papaya that helps to prevent damage cell through the process of antioxidant. It is Vitamin E that supports collagen production, a substance that nourishes the skin and makes flexible. In other words, we can say that eating papaya can give young-looking skin. It also has “Beta carotene” that additionally smoothes away the wrinkles and give skin a fresh new look. Try a papaya facial mask and give your skin restorative look with this magic element. Papaya Seed Oil can furthermore be used for taking care of healthy skin and for dealing with certain skin problems. Generally, blood clots are a good thing on the outer surface when you get injured. The blood needs to solidify and cluster together at the place to help stop the bleeding. However, it sometimes can get up into big trouble when they’re not needed especially within the body in the deep veins near muscles. The blood when clots can narrow or even block blood vessels, sometimes they can dislodge on and travel in the heart or brain and can result in a stroke or heart attack. The Papaya contains “fibrin” which helps to prevent blood clotting and enables the blood to flow freely in the body. So seeing benefits hope you might make sure to put a slice of papaya in your morning cereal or in your breakfast. Cancer is an ailment that is defined as “out-of-control cell growth” in this abnormal cell grows and invades to all parts of our body. The antioxidant’s properties in papaya are recognized for effectively fighting against cell growth. Papaya has high levels of tannins, flavones and different powerful antioxidants that can combat free-radical damage. Papaya can reduce the risk of growing prostate cancer in man if consumed combined with green tea. Papaya has a powerful anti-oxidizing activity that might also prevent cancer in your blood and bone marrow. Besides this, it has an amazing “enzyme” and “papain” that can help to relieve the side effects of chemotherapy. It has also been found that papaya has beneficial effects on mouth sores. The fruit has been shown to be protective against colon cancer. Papaya has anti-inflammatory characteristics of the additional health benefits of eating papaya. According to the Journal of Molecular Nutrition & Food Research report published on 24-Mar 2011 stated that inflammatory effects were decreased when given papaya. From this conclusion, researchers believe that papaya can be useful in reducing inflammation and might be helpful in rheumatoid arthritis, which is generally caused due to inflammation. The other benefit of consuming papaya is that it increases body temperature that can have a soothing effect on the acne, pimples and other skin inflammations. So eating papaya can keep you healthy and Anti-inflammatory effects can reduce inflammation the element for slowing down the aging process. Papaya fruits, as well as the seeds of papayas, are known to be good for heart health. It is due to its powerful antioxidant properties as well as a vitamin such as a vitamin A, vitamin C, and vitamin E. The vitamins and antioxidant in papayas are helpful in preventing problems such as atherosclerosis heart disease. Generally, cholesterol attaches to the walls of the blood vessels and form plaque that can result in heart attacks and strokes. The presence of pro- carotenoid phytoalexins helps to lower free-radical damage, and the oxidization of cholesterin reduce the power of cholesterol to form plaques on the artery walls. In addition, papaya is rich in fiber that can also help to reduce the cholesterol levels in the body. So try to include papayas in your daily diet and keep your heart young and healthy. 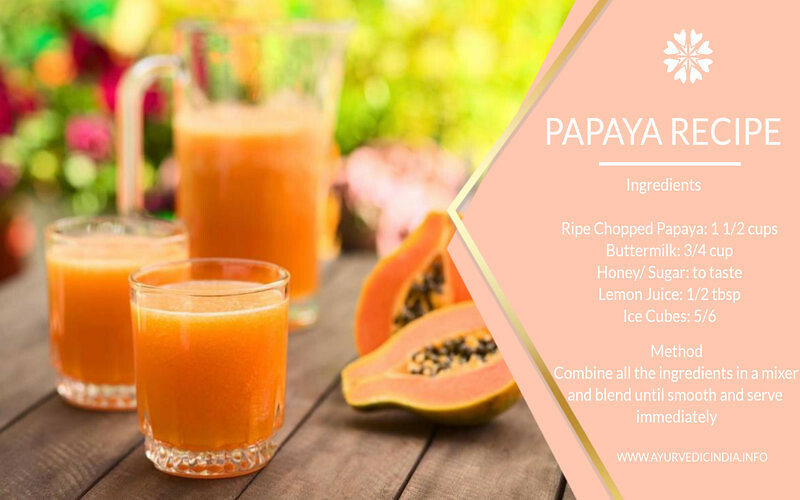 Papaya’s nutritional charts are amazing as it is packed with the most fundamental minerals that are important to your body. Below is an instant energy booster that can be good for digestive, weight loss and eye care. 1. Combine all the ingredients in a mixer and blend until smooth. 2. Pour into four individual glasses and serve immediately. It promotes healing: The enzyme in papaya can help in digestion; you can also take after meals to help in digestion. It promotes Weight loss: As it is low in calories, it can be a good choice for those looking forward to losing weight. It promotes eye health: As it has lots of vitamin A, vitamin C, and vitamin E, it helps eyesight. So good news for Internet surfers, TV fans and book readers. In Pregnancy & breastfeeding: Consuming Papaya is during pregnancy is possibly unsafe. Certain evidence shows that unprocessed “papain” a chemical found in papaya might poison the fetus or can cause birth deficiencies. Not enough known as a safety in the condition of breastfeeding. The first steps trying to avoid or take in small amounts. In Diabetes Patients: The fermented papaya can lower the blood-sugar level. The people with diabetes taking medications should pay close attention to their blood sugar levels and should make adjustments if needed. In Hypoglycemia Patients: The fermented papaya can lower the blood-sugar level. The people with Hypoglycemia taking medications might make blood sugar too low. Allergy: Papaya have properties called “papain”, the people allergic to papain must avoid eating papaya or taking products with papaya ingredients. Surgery: fermented papaya is known to lower blood sugar. This might affect blood sugary during and after surgery. It is advised to stop taking papaya for two weeks before surgery if you are taking papaya. Never thought that papaya and its leaves will be so beneficial to human body. Thanks for this amazing article as it was so informative and I will definitely share to someone battling diseases like dengue and cancer. Papaya leaf juice so many nutrients and it helps in fighting the dengue well by increasing the immunity and platelet count. Thanks for sharing this impressive piece of information among us. Keep up the good work.